Added as part of the Austin E. Knowlton Athletics Complex project in September of 2014, the Knowlton social space is a large room and outdoor area in the southwest end of the stadium. The immense social space serves as a meeting space for Oberlin College staff and students, while also hosting banquets and other gathers. 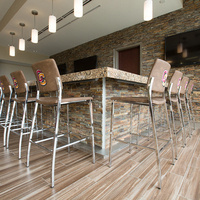 The social space is equipped with a bar area, two projectors and an outdoor patio space.